However you decide to dispose of your dog's poop, make sure to clean it up immediately. Editor's note: Matt Hickman is an eco-living expert who blogs about the best way to go green at home. You can technically compost dog waste but treat it like you would human waste while backwoods camping: Bury it in the ground -- and bury it deep. Do not mix dog waste with food scraps and other organic waste that you compost in the worm bin. 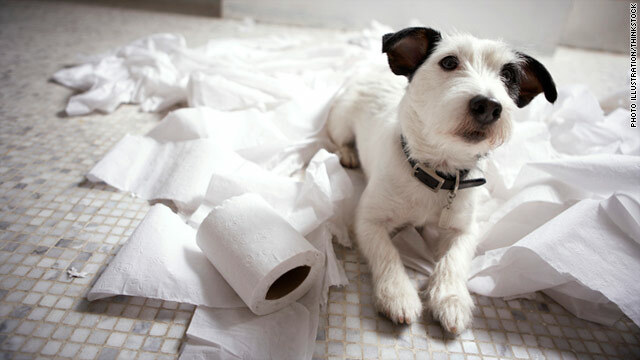 Dog waste, as you might know, can contain hard-to-kill, disease-carrying pathogens, so you don't want it mixing with your normal compost-to-fertilizer mix. If you fertilize edible plants with the stuff, you're putting yourself at serious risk. You'll want to bury your dog's waste in a somewhat remote area of your backyard, far away from any veggie gardens and also a good distance from streams, wells and other water sources, since there is the risk that it can contaminate groundwater supplies. The Natural Resources Defense Council (NRDC) recommends checking your water table before you bury pet poop. The NRDC recommends digging ditches at least 5 inches deep, but I've read elsewhere that it should be at least a foot to keep curious critters away. Also, in lieu of some kind of shovel, you can scoop with a corn-based biodegradable pet waste bag and chuck it in the ditch. All in all, it's an easy process as long as you select an appropriate site. And here's another option: the Doggie Dooley, an in-ground pet waste disposal system that functions like a mini septic system for dogs. It costs less than $100 and could be a wise investment if all that ditch-digging gets tiring. However you ultimately decide to dispose of your dog's poop, please make sure that you clean it up as soon as it hits the ground, whether in your backyard, in the park, or on the streets of your neighborhood. If you don't, those parasitic unsavories like E.coli and Giardia (aka Beaver Fever) before might get washed away and enter local water supplies.